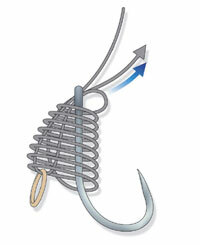 This relatively new knot is one for the angler who needs to catch, bait up and fish at speed. It gives the angler the hooking power of the knotless knot, while at the same time provides the angler with the ability to attach hard baits like pellets, on to the hair, really quickly. There's no need to use a drill, a baiting needle or a hair stop when using this knot - the tiny bait band grips around the circumference of the hard pellet secrely enough so that the bait can be cast. 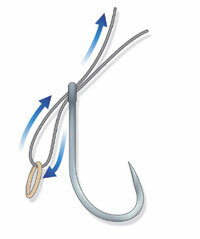 Thread your hooklength through the front of your eyed hook then through a bait band. Now pass the hooklength through the back of the eye of the hook. 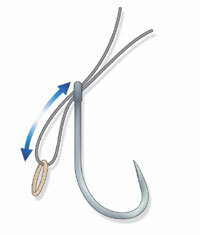 Hold the bait band and hooklength loop securely. 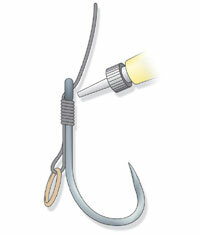 Take the tag end of the hooklength and whip it around the hook and hooklength loop. Whip the line around eight times, keeping tight turns at all times. Ensure all the whippings are secure and tight, then make one final whip up and over the previous whippings, then thread the hooklength tag end through the back of the hook's eye. Add a drop of Superglue to the whipping to secure it in place, then trim off the tag end as close as possible to the eye of the hook.